An easy, satisfying soup! Serve with our fresh baked bread! Add leeks and cook, stirring until very soft, about 5 minutes. Add cauliflower, 2 cups cream, water, bay leaf, salt and pepper. Bring to a boil over medium-high heat, stirring often. 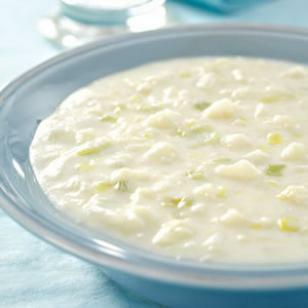 Reduce heat to a simmer, cover and cook, stirring occasionally, until the cauliflower is soft, about 8 minutes. Meanwhile, whisk the remaining ½ cup cream and Thick'n Saucy together in a small bowl. When cauliflower is soft, remove the bay leaf and stir in the cream mixture. Cook over medium-high heat, stirring until the soup has thickened, about 2 minutes more.